Cut-away rendering of CUTE, with transparent top and sides to display the telescope and spectrograph. CUTE has three coarse sun sensors, a star tracker, an S-band transmitter to send data to Earth, and a UHF antenna (not shown) for command uplink. 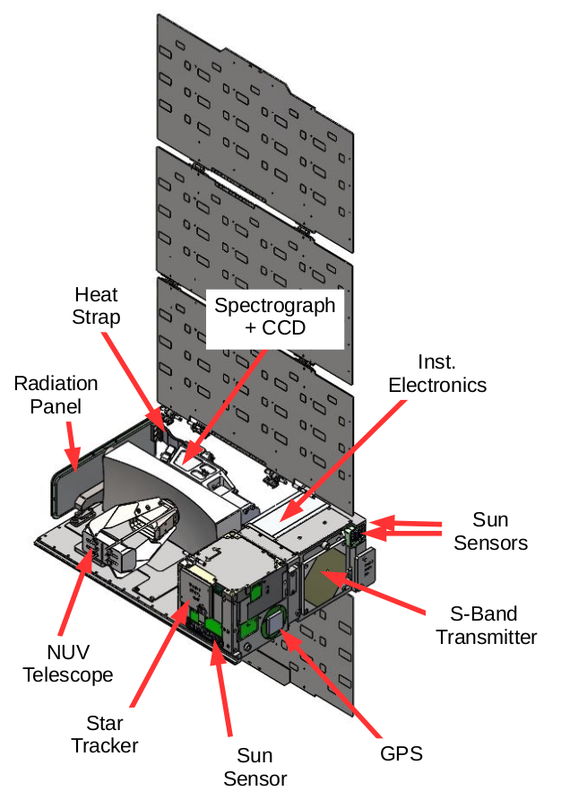 The Colorado Ultraviolet Transit Experiment (CUTE) is a 4- year, NASA-funded project to design, build, integrate, test, and operate a 6-unit CubeSat (30 cm x 20 cm x 10 cm). CUTE will have a 1-year mission life time and will launch in 2020 and use near-ultraviolet (NUV) transmission spectroscopy from 255 to 330 nanometers (nm) to characterize the composition and mass-loss rates of exoplanet atmospheres. CUTE measures how the NUV light from the host star is changed as the exoplanet transits in front of the star and passes through the planet’s atmospheres. CUTE’s spectrally resolved lightcurve will provide constraints on the composition and escape rates of these atmospheres, and may provide the first concrete evidence for magnetic fields on extrasolar planets. The keys to unlocking the diagnostic potential of these systems are spectral coverage in the appropriate bandpass and the ability to follow the systems for several orbital periods. CUTE is designed to provide exactly that – low resolution spectroscopy of critical atmospheric tracers (Fe II, Mg II, Mg I, OH) that are inaccessible from the ground, and a dedicated mission architecture that enables the survey required to characterize atmospheric structure and variability on these worlds. CUTE is being constructed at the University of Colorado, Boulder and the Laboratory for Atmospheric and Space Physics (LASP). Dr. Kevin France is the Principle Investigator of the CUTE mission at LASP. We’re just getting started with CUTE, so stay tuned for more details and updates!